Location, accommodation (lots of space for family of 6) and staff. Great location close to Charles bridge. The hotel is in a historic building but the facilities are new. We stayed at a top floor flat with a room on the loft. We can see the nearby church from the window. Btw, there's a lovely rabbit in the manager office. We rented Unit 3, a 2 bedroom, 2.5 bath apartment for 5 nights that was extremely spacious, very clean and secure. The size of this unit allowed us to have time together comfortably. The well stocked kitchen allowed for having breakfasts in saving us time and money. The market was a few blocks away. This unit had a wonderful mix of contemporary and antique looking furniture that was all in excellent condition and together created lovely affect. I was worried about the apartment being too cold or too hot but the controls were in our hands. Washer/dryer was handy to have. Plenty of hot water for showers, nice towels and good hair dryer. The hosts were on site daily and very helpful. The building is in a very charming part of town with many restaurants/shops literally outside the door. Uphill is Prague Castle and downhill in Charles Bridge. The American Embassy is a couple of blocks away. The office ladies that check you in and out, and help with miscellaneous questions, were very pleasant to work with and helpful. The breakfast baskets were also a fun surprise. Yes you have to order them in advance and pay for them, but they are worth every penny! The quality of the food is excellent and the amount is very generous. The “breakfast” fed us 2 breakfasts and a lunch! Plus the baskets and charming jars everything comes in was a nice touch. Fabulous location, friendly and helpful staff, nice sized apartment. One of the best places my family has ever stayed. They could teach a class on hospitality. So helpful and welcoming. Its a unique place, very beatiful and honestly the best location. Hosts are great. We had a fabulous stay here. It was centrally located to so much of what we wanted to see and do. The apartment had wonderful, historic charm. It was the perfect end to our trip. Fantastic views, comfy beds, the best of the old with modern convenience. 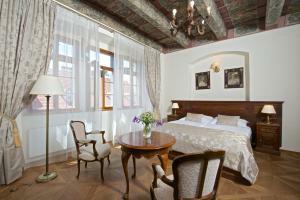 It was a wonderful property at an amazing location right below the Prague castle. Beautiful heritage apartment. 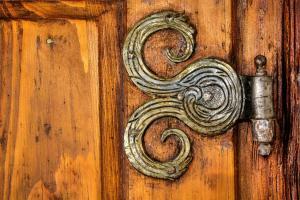 Lock in a great price for Residence U Mecenáše – rated 9.7 by recent guests! Residence U Mecenáše This rating is a reflection of how the property compares to the industry standard when it comes to price, facilities and services available. It's based on a self-evaluation by the property. Use this rating to help choose your stay! 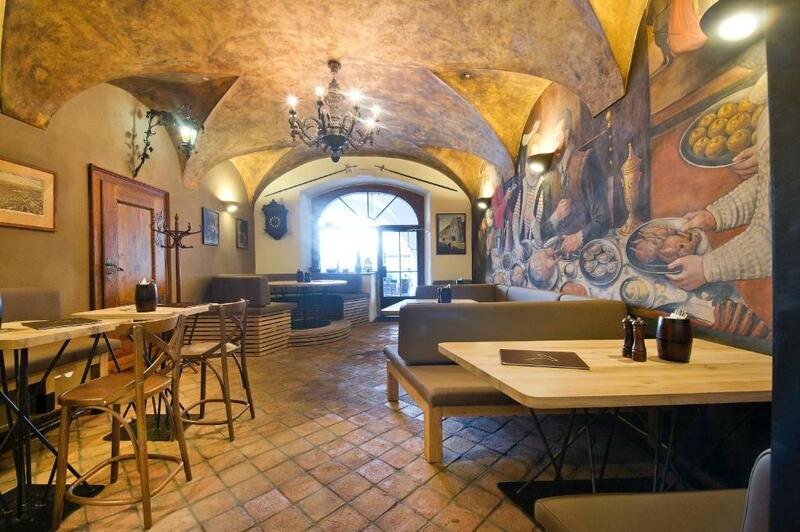 One of our top picks in Prague – and a guest favorite. Located in Prague, Residence U Mecenáše is set in a historical building built in 1608 and during 2015 and early 2016 has been completely renovated. 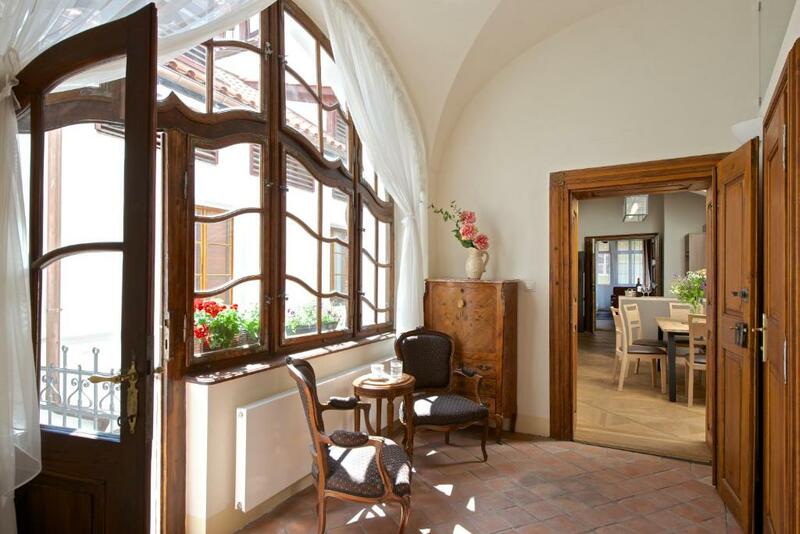 Just 1,300 feet from Prague Castle and the St. Vitus Cathedral, it features a prime location. WiFi is provided free of charge. The 7 apartments, all individually and tastefully furnished, are all equipped with a fully furnished kitchen including a microwave, refrigerator and dishwasher and a bathroom with toilet. Guests can enjoy a good sleep on Toscana medical mattresses. The ceilings of the apartments are originally decorated. The apartments are accessible by stairs only. Gourmets will certainly come into their own in our Restaurant U Mecenáše. Charles Bridge is 8-minute walk away. The nearest airport, Vaclav Havel Prague Airport, is 6.2 mi distant from Residence U Mecenáše. Garage parking is available within a 15-minute walk. Public parking is available for a surcharge upon request. 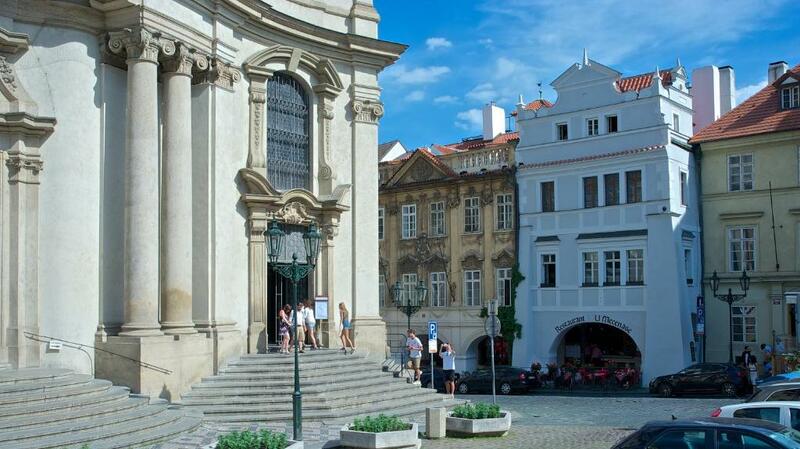 뀐 Located in the real heart of Prague, this property has an excellent location score of 9.9! When would you like to stay at Residence U Mecenáše? The spacious and elegant apartment with original decorated ceilings and Viennese cross board flooring is located on the 1st floor. The apartment has 2 separate bedrooms with private bathrooms, and a living room with an extension sofa bed for 2 more guests. One of the bedrooms has an in-built closet. A small balcony is available. Public parking is available at a location nearby (reservation is needed) and costs EUR 16 per day. 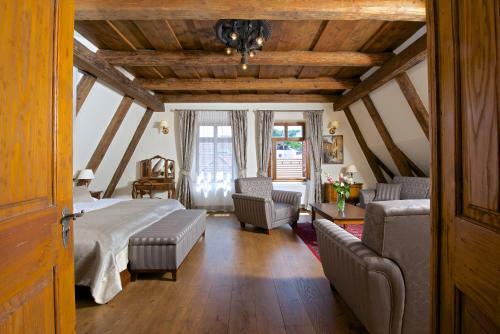 Located on the 2nd floor, this luxury 2-bedroom suite features views of the Prague Castle and the Church of St. Nicholas, original decorated ceilings and Viennese cross board flooring. Cozy and quiet apartment on the 2nd floor of the residence. The apartment consists of bedroom part with king-size bed, dining part, living part with sofa, bathroom and fully-equipped kitchen. The whole apartment is equipped with modern furniture and elegant antique pieces. The apartment is suitable for two adults and a sofa-bed can provide a bed for two more. Luxury light and spacious apartment on the 2nd floor with windows facing Tržiště street where the US Embassy is located. The apartment has 3 separate bedrooms, 2 bathrooms, a large dining room and fully equipped kitchen and a separate toilet. All rooms feature original beautifully painted ceilings. Cozy apartment on the top floor accommodates up to 3 people. The small windows offer breathtaking views of Prague’s historic landmarks. The flat consists of the living area with a deck chair and an attic bedroom. Please note that the staircase to the bedroom is very steep and therefore is less suitable for children and people with mobility difficulties. An extra roll-away sofa is possible for additional charge of 20 EUR. Located on the top floor, these apartments with city views consist of an attic bedroom combined with a living area for 2 people and a bedroom for 2 people. 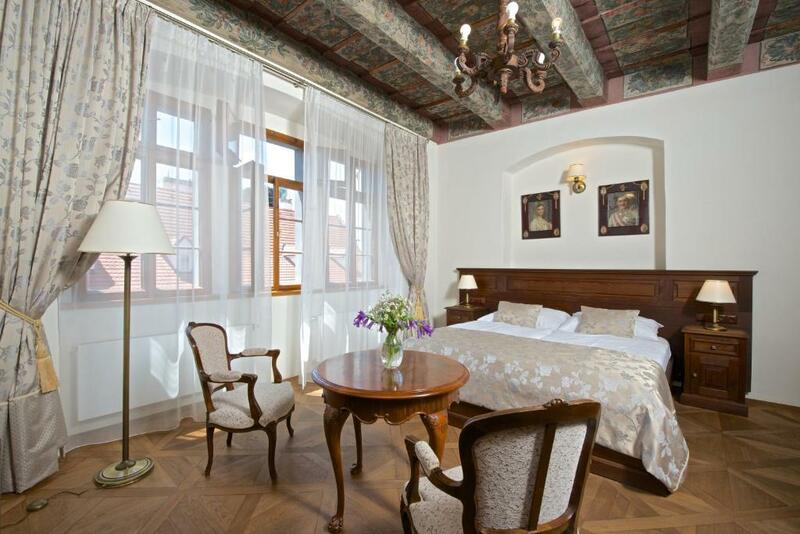 The apartments features a decorated ceiling or a beam ceiling and have views of the red tiled roofs of the old Prague, Church of St. Nicholas and the Prague Castle. Luxury apartment with 3 separate bedrooms and a rooftop terrace with panoramic views. Two bedrooms located in the attic offer picturesque views of the old Prague. The generously sized main bedroom offers super-king sized bed and a living area with sofa and flat screen TV. There is a full equipped kitchen with a dining room. 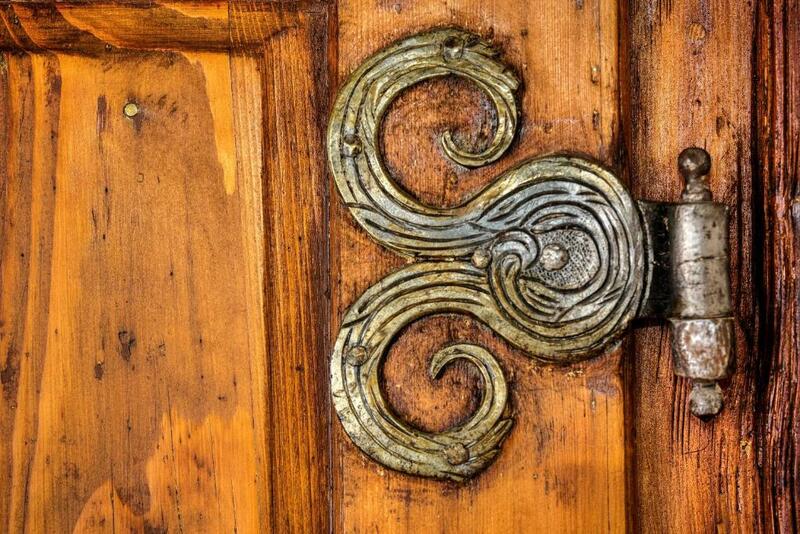 The apartment is equipped with stylish furniture and elegant antique pieces. 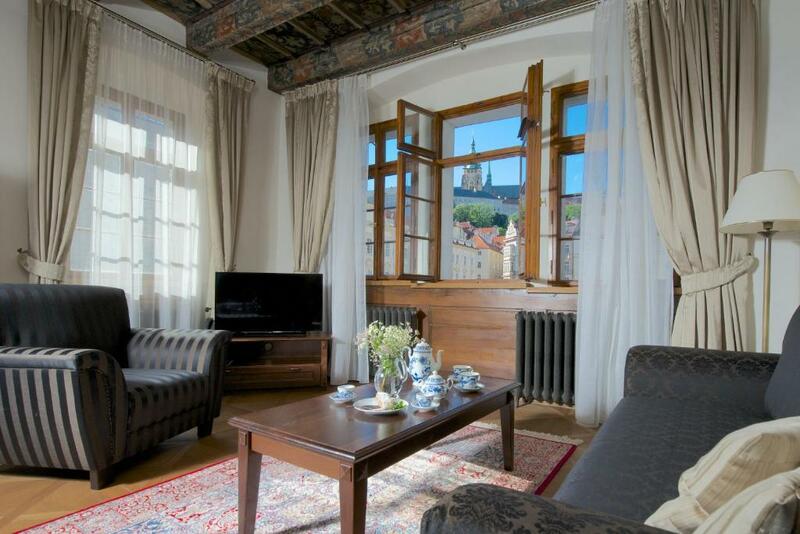 Located on the top floor, the apartment features a beam ceiling from the 17th century and offers views of Lesser Town Square, Church of St. Nicholas and the Prague Castle. Family residence in historical centre of Prague. Me and my family have renovated these beautiful apartments in the historical heart of Prague near St. Vitus Cathedral and Prague Castle. I would love to take care of you in one of them - that is what I like. V těsné blízkosti se nachází Katedrála Sv. Víta spolu s Pražským hradem a také známý Karlův most, který nechal vystavět Karel IV. Area Info – This neighborhood is a great choice for travelers interested in history, architecture and atmosphere – Check location Excellent location – show map Guests loved walking around the neighborhood! House Rules Residence U Mecenáše takes special requests – add in the next step! Residence U Mecenáše accepts these cards and reserves the right to temporarily hold an amount prior to arrival. Please note that hen and stag parties cannot be accommodated. Please inform Residence U Mecenáše of your expected arrival time in advance. You can use the Special Requests box when booking, or contact the property directly using the contact details in your confirmation. The breakfast was really good! The location was perfect. The building and its history were interesting. The staff was perfect! Our suite was more beautiful that we pictures show. The ceiling was painted in the 17th century! We will stay there again. Welcoming, helpful, approachable, professional and obviously dedicated team of staff. Wonderful architecture inside and out and great location. Could maybe supply a DVD player or some streaming channels for the tv, so kids can watch movies. But very small point, I prefer no tv at all so good for me. Hosts supplied a city map but a smaller, local map showing location of bakery (artic bakehouse was good), PO, supermarket etc might help, but again very small point. Two bed apt was large, high ceilings, great decor, fine views. Coffee machine and kitchen a plus. Hosts were very good. Tram stop only a very short walk, no. 15 takes you straight to main station. Bridge a short walk away, great location. Good place. We were on level 5 and there was no elevator so dragging bags and kids up 6 flights of stairs was exhausting!! Beds in attic room in cramped area and hard to access (mind your head) Food and drink in the bar/restaurant over priced. Good friendly staff and a very good location. Would have liked a broom as the floors got quite dirty with 6 people in and out all day, and extra tea towels for the kitchen, cooking in a group gets quite messy! Also, a few kitchen staples like olive oil, vinegar and a few herbs to go along with the salt and pepper supplied would have been nice. We didn’t find any placemats or drinks coasters for the lovely table. The third bedroom has twin beds that we had to push together ourselves, would have been nice to have it made up as a double before we arrived. But these are just small things that would enhance the stay, didn’t really detract. Absolutely everything. From the moment of first contact they have been nothing but super helpful. Easy and friendly greeting and checkin on arrival, helpful hosts who were happy to help with anything we might need, extremely comfortable bedding, and heated floors in the bathroom was a nice touch. Felt very luxurious in early March. Apartment was nice and warm but we could open windows to get fresh air if needed. Loved having a large kitchen as dining room for our group of 6, most equipment available. Very spacious and nice to have two full bathrooms and seperate WC, great for groups. Was much bigger than the photos look. It is very close to walk to many shops and restaurants (do try their restaurant downstairs, delicious!) and so close to the Charles Bridge! Easy to get around, an off license type market around the corner and a large supermarket a few minutes tram ride away. Couldn’t have asked for a better place. We will absolutely be staying here next time we visit Prague, and will be recommending everyone to do the same. Thank you to the whole team, you do a wonderful job! We stayed in the 118m2 apartment, its 's spacious and fresh. Interiors are stylish and historical. Beds are comfortable and the kitchen is fully equipped. Great location, central and quiet, closed to the castle and Charles bridge. Pubs, restaurants, small groceries and coffees are just outside of the building. Safe to go out even in the evening and enjoy the surroundings by night. Tram is just 50 meters from the accommodation, easy and cheap way to discover Prag. Lovely and really helpful stuff! This accommodation is perfect, definitely worthy every penny!HIGHLY RECOMMEND!! The decor and friendly staff. The restaurant downstairs for first class in everything. No criticisms but be aware there is no lift if stairs are a problem. Staff very helpful and welcoming, nothing was too much trouble. Spacious 3 bedroom apartment. Beds were comfortable. There was tea and coffee pods for the coffee machine. Nice soap dispensers in the bathrooms. Nice restaurant serving good food at reasonable prices. Excellent position. Absolutely nothing. A point of mention would be the character and feel of the apartment as conveyed by the photos provided. The scale of the property was not reflective in those photos, and the sheer grandeur was only appreciated once we first stepped foot inside. Spectacular. Not being strangers to Prague, We were this time looking for somewhere to stay with a modern vintage (1940-1960) décor. The flat not only delivered on this and everything else advertised, but far more. An incredible amount of attention-to-detail has obviously gone into creating the overwhelming sense of character felt when entering the flat for the first time. Facilities were second-to-none. Owners were incredibly accommodating; We already looking into when we can next return to Prague, whilst hopefully again regarding this apartment as a second home, just as we felt whilst we were there. We really liked it! Just be aware that the building is 600 years old and has no elevator. The hotel was spacious and conveniently located. It is located in Lesser Town which is more quiet than Old Town. It was only a few minutes walk to the Charles Bridge and near the castle. I loved that the room had been renovated but the old world features were kept.